The international bestseller by Dr. Peter D'Adamo, continues to change the way we eat and live. Dr. D'Adamo's groundbreaking medical and genetic research reveals that blood type is the key to your biochemical uniqueness. When you eat right for your type, your body responds the way nature intended. 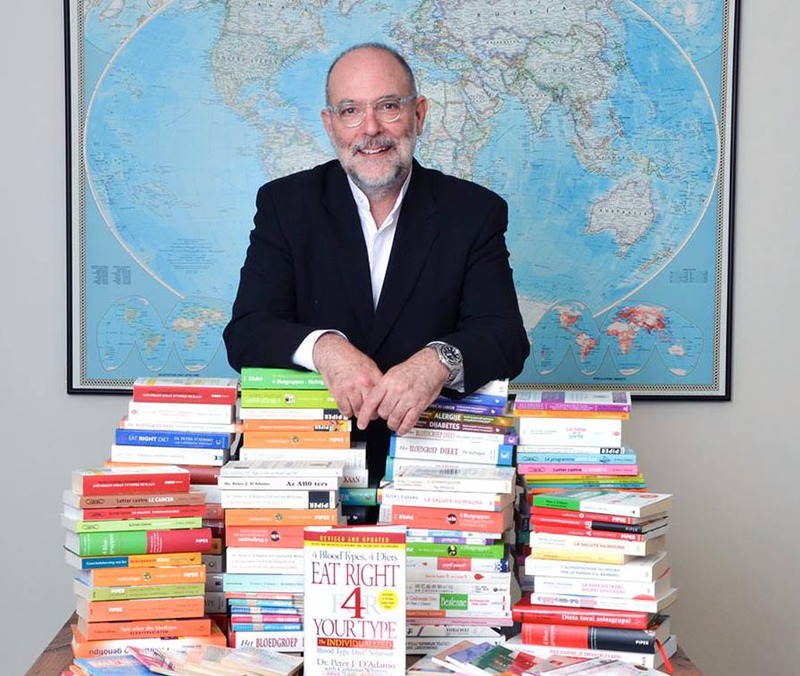 With more than 7 million hardcover copies in print, translated into 60 languages, and voted one of the "Ten Most Influential Health Books of All Time", Eat Right 4 Your Type has made a lasting mark in the field of diet and nutrition, with a simple, effective formula: 4 blood types; 4 individual diet plans. Eat Right 4 Your Type has won praise from leaders in nutritional and genetic science, as well as popular celebrities, including Jennifer Lopez, Cheryl Tiegs, Hugh Grant, Lee Trevino, Elizabeth Hurley, Sir Cliff Richards, Shirley Maclaine and Ellen DeGeneres. Millions of followers confirm the reason for its success: It works. "I strongly recommend this book to anyone who is trying to lose weight, reduce stress, and increase their overall health. I have lost weight, but more than that, I am more healthy than I've ever been in my life. I don't believe Dr. D'Adamo would have done such strenuous research, nor would people be doing so well on the diet, if it was just another way of telling people to eat right and exercise." "This book was very informative. East to get through quickly with lots of great tables and menus. Would recommend to anyone looking to try a new or different approach to dieting." "I found this book to be very useful. Other family members have also. I have been following the bloodtype diet since I received the book and feel so much better!" Eat Right For Your Type (hardcover only). Live Right 4 Your Type seamlessly follows the path paved by its phenomenally successful predecessor, NY Times bestseller Eat Right 4 Your Type. New data looks at the importance of "secretor subtype" as a refinement to the Blood Type Diet, and the use of blood type genetics to help understand the mind-body connection. Extensive new food lists and prescription recommendations. In Live Right 4 Your Type, perhaps the Magnus opus of the blood type theory, Dr. Peter D'Adamo distills the voluminous data on blood type, physiology, and metabolism into a series of fascinating observations and simple guidelines. Live Right For Your Type (hardcover only). Your genes are not just the "hand" you were dealt. You can change the way your genes are expressed - in the same way you can affect light in a room by turning a switch on or off. The GenoType Diet (renamed Change Your Genetic Destiny in softcover) uses the new science of epigenetics, which shows how environmental factors - including diet - allow you to change your genetic destiny. Your health risks, weight, and life span can all be improved when you live according to your GenoType. Dr. Peter J. D'Adamo rocked the diet world more than ten years ago when he discovered that blood type was a determinant for the kind of food that would help maximize health and weight loss. Since then, Dr. D'Adamo has used the new and exciting research from the human genome project to further refine his system of types. Change Your Genetic Destiny (softcover). Dr. Peter J. D'Adamo has established himself as the world's most popular and respected authority on the connection between blood type and eating, cooking, healing, and living. Medical studies proving the connection between blood type and disease. Entries on the most widely used prescriptions will help readers find out what is helpful or harmful to their blood type. Food, herb, and supplement entries give specific information by blood type on efficacy for different conditions as well as overall health. A comprehensive introduction lays out the history of blood type science as well as confirmation of D'Adamo's theories yielded by the new maps of the human gene. The Complete Blood Type Encyclopedia. Now, you can help your baby get started right. It's never too early to start a healthy blood type diet lifestyle. Help your baby get the best possible start in life with Dr. D'Adamo's Eat Right 4 Your Baby. Dr. D'Adamo follows his best selling health library with a program designed to provide optimal conditions for fertility as well as for pregnancy and childbirth. Divided into sections for the 4 blood types, Dr. D'Adamo provides nutritional strategies--including recipes--offering detailed advice on what foods to consume, avoid, and how frequently to eat. He also suggests exercises for before and after birth that are based on type. This is a complete, easy-to-use guide that every health conscious parent to-be should have. 431-page paperback book. Eat Right For Your Baby. This completely revised and updated 20th Anniversary edition of EAT RIGHT 4 YOUR TYPE makes this worldwide phenomenon even more accessible.